One of my most favorite easy meals is slow cooker balsamic shredded beef! The reason it’s so easy is because it comes come with a laundry list of ingredients or steps in order to churn out some ridiculously delicious meat. While I enjoy cooking, I don’t have a ton of time. Recipes like this one make my life easier because they are so endlessly flavorful. And they make a lot of food that I can repurpose into other dishes when I’m short on time seeing clients. This slow cooker balsamic shredded beef recipe is gluten-free, dairy-free, and paleo. There’s no browning of the meat required. I used to do that step, but out of sheer laziness one time, I didn’t do it. The meat came out just as good. Plus, this dish freezes really well. Just make sure to include the liquid from the dish, and you’ll be good to go. When I shared a picture on Instagram of this defrosted deliciousness, people demanded that I share exactly how I made it. 1. This recipe requires broth or stock. It doesn’t really matter whether it is vegetable or beef to be honest. Beef broth or stock will make it slightly more flavorful, but not having it isn’t a deal-breaker. Here’s how I make my own bone broth if you’re looking for an easy recipe. Otherwise, you can buy pre-made broth at the grocery store or use bullion cubes. If you go this route, you MUST make sure that whatever you buy is clearly marked gluten-free. Don’t assume they are gluten-free simply because there shouldn’t be gluten in them. There are brands that have gluten in them. Here’s the bullion cubes that I use since so few are actually gluten free. 2. The onions become really sweet, so don’t skimp on them. Trust me… you’ll be glad you didn’t. 3. I get my beef from Butcher Box. They make it super easy to get grass-fed and grass-finished beef sent to you. It doesn’t matter where in the US you live. And you don’t have to depend on the grocery store to carry it. It’s been a lifesaving service and I also have appreciated their pork and chicken cuts as well. High-quality meat is important to help increase Omega-3 consumption as well as reduce overall toxin exposure. Both points are key when you’re working hard to get your health back on track after being sick for a long time. I was skeptical at first if I’d like the whole delivery service aspect, but it’s really been a wonderful addition to our food routine. 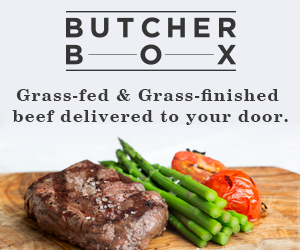 So if you haven’t yet done so, check out Butcher Box! 4. It’s okay that the liquid doesn’t initially cover the meat. I promise you that it will all cook and more liquid will be in the slow cooker when it’s done. 5. You can be rather liberal with your cuts of meat that you use. A chuck roast is great, but you can also go with boneless spare rib cuts. I’ve even used cuts of beef that I bought at the store that were frozen that I just wanted to use up. It all turns out the same. 1. Eat it with a sweet potato and roasted veggies. 2. Add it over gluten free pasta and top with some freshly grated parmesan cheese (if you’re okay with dairy. You can also add some peas to this version… it’s quite good. Just heat some up from your freezer! 3. Heat it up until it’s warm (not hot) and top a salad with it loaded with greens and other fresh veggies! These are a few ways that I’ve enjoyed this recipe. It’s really versatile and reheats well. Whatever you do, don’t throw away the liquid. If you want to drain the meat, that’s fine. But please save the liquid and use it. It can absolutely be frozen and used in the future. It’s just too good to waste! Delicious balsamic beef recipe that doesn't involve any browning. It's yummy on it's own or even as a topping to gluten free pasta. It also freezes well. Prep carrots and onions and add them to the bottom of your slow cooker. Mix garlic powder, pepper and salt in a small bowl and set aside. Lightly coat the meat with the spice mixture and place in the slow cooker on top of the veggies. Heat up stock (or make it from 1 cup water + 1 bullion gluten free cube) in a small pot. Once it's almost boiling, add entire can of tomato paste and vinegar. Stir until incorporated well. Once all the meat is inside of the slow cooker (it's possible to use multiple pieces in this recipe), pour hot mixture over top. Add bay leaves by tucking them down opposite sides of the slow cooker so that they are in the meat rather than laying them on top. Place the lid and set the slow cooker to LOW. Cook for about 10 hours (ie. overnight). Meat will be very tender, fragrant, and easily shreddable with a fork when done. Before shredding the meat, make sure to remove the bay leaves. Then use two forks to pull the meat apart. Enjoy with the sauce or separate the meat and use on it's own. This dish freezes well. Make sure to keep the liquid in with the meat when you freeze it. This recipe rocks — so easy and delish! Prepped everything the night before and put it on before I left for work. Next time I’m going to add celery and mushrooms. I only used 2 onions which is plenty. Definitely one of my favourites!! Thank you! Thanks for sharing that, Robin!!! I’m so glad that it worked out. I’ve never added celery or mushrooms… please let me know how it turns out!! !